Voice your opinion! Review Optical Express now. I have been struggling with an eye allergy for a couple of months now, and I always have the same doctor Rushine from Shaftesbury Avenue, which I find very important as she knows my history. She has been very friendly and helpful from day one. Always on top of the game to help me with my situation and to advise me the best solutions for my eye treatment. So far the whole experience with all the Optical Express staff it is been a pleasure. Good, on time and quick service. 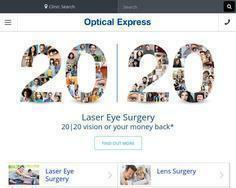 Is Optical Express your company?